Ritchard as the Wolf is exquisite. His dialogue is snappy, his mannerisms right on that line between charming and creepy. His costume includes big sleek sideburns, large pointed ears, and a furry suit jacket. He introduces the premise and then tells us that Red Riding Hood, aka Lillian, was a girl a bit too obsessed with fashion. The film cuts to Minnelli (only 19 at the time!) as Lillian, talking to her mouse friend (dancer in a costume) about how much she really wants something striking and red in her wardrobe, to attract some attention. Her mother gives her a new riding cape for Christmas, and it's... blue. But it's lined in red, so Lillian flips it inside out and sings about how much she adores it. The songs in this, by the way, are a huge cut above most holiday special fare. 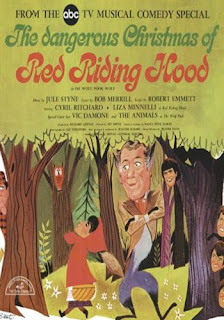 They're by Broadway composer Jule Styne, and they are packed with clever rhymes and wordplay. Bonus Holiday Connection! Jule Styne is the composer of Let It Snow, Let It Snow, Let It Snow. Lillian is sent of by her mother to deliver Christmas presents to her Granny. She enters the woodland set and the next sequence is an extended dance, as all the various animals of the forest travel alongside her. The choreography is really solid: the different animals showcase different styles. (Lee Theodore did the choreography, she was a dancer and choreographer for Broadway and film.) The costumes are fascinating, too. The whole thing really gives it that fairy tale feel. We cut to the wolf and his pack, played by British band The Animals. Wolf wants to be friends with Lillian, be a more refined, civilized sort of fellow. The pack tell him he's being foolish. Unfortunately for the potential friendship, Lillian doesn't trust wolves, and runs off. The wolf and the pack sing a funny song about the tension between the instinct to eat people and civilized behavior. It includes a Hamlet pun. One of the elements I loved overall about this was how clever the writing is. It's packed with delightfully complex vocabulary, puns and sly jokes. Lillian travels onward and meets a woodsman, who mostly sings instead of speaks, and thinks he might be a prince under a spell - but he's not sure. She's smitten by him, and gives him the knitted kneewarmers she had made for Granny. He gives her a song, and she's half-charmed by this and half-freaked out. He has a stellar voice. He closes with a little cheek kiss, and she runs off to do a monologue song about being flustered by the attention. This was probably the weakest song in the special; some of the words were confusing or awkwardly placed. The wolf, meanwhile, has been watching this interchange, so he disguises himself as a second woodcutter and re-uses bits of the other guy's speech and song to try to flirt with Lillian. But after a while she realizes the trick and rejects him. He declares that he'll get revenge. The Animals next do a song in their style. This part didn't age so well, and it doesn't really mesh with the tone of the rest. We cut to Granny's, the wolf has already stuffed granny in a cupboard and disguised himself. After a bit more snappy dialogue, the wolf gives Lillian one more chance to consider that all wolves aren't bad, but she is firmly species-ist, and slanders all wolf-kind. Of course she's immediately proven right. After a zany number with a humorous counterpoint and a lot of double meaning, the 'what big eyes you have' sequence plays out as a tango, and a chase sequence ensues all around the cottage. Meanwhile, Lillian's mouse friend has gone for help from the woodsman, and he runs in just in time. And he sings. And the wolf gives up, because he can't fight a voice like that. 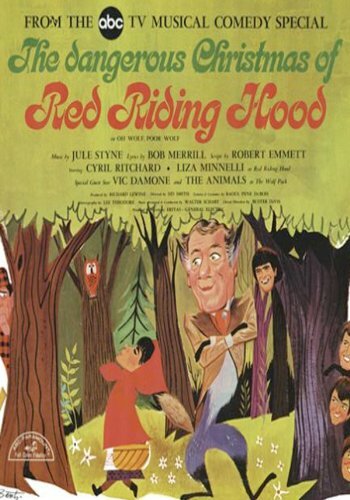 In the closing sequence we return to the wolf in the cage, and while he doesn't seem sorry for having tried to eat Red Riding Hood, he is lonely. However, the skunk family next door invites him to a Christmas party, as a bit of a consolation. Everyone comes back on stage for a brief closing number and we're done. We really enjoyed this. The film isn't in the best condition, and every so often the fact that the wolf is so charming strays into unpleasant implications. But this is a quirky, relatively unknown piece that is smart and funny and had a lot of talent behind it. Check it out if you're a fan of musicals or clever writing or fairy tale retellings. We rented it on Amazon Instant Video.